Former star Geremi says it is time for the latest generation of Cameroonian players to deliver for their country. Cameroon face Tunisia in Yaounde on Sunday, knowing a win will send them to the 2014 World Cup in Brazil. The Indomitable Lions lost all three of their games at the 2010 World Cup before failing to qualify for either the 2012 or 2013 Africa Cup of Nations. "It's a new generation and they know they have not yet done anything for their country," Geremi told BBC Sport. "They are a conscious of that, they know they have to do something - not only for themselves but for our people too. 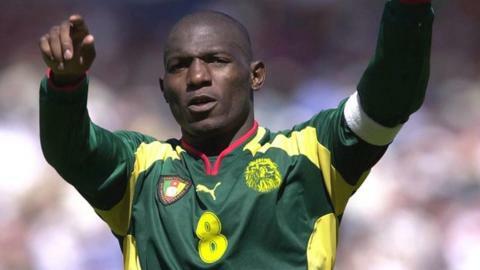 "Cameroonians are waiting and expecting the team to qualify for the World Cup," said a man who won two Africa Cup of Nations titles and an Olympic gold medal for his country. In last month's first leg in Tunisia, the game ended goalless - largely thanks to an excellent goalkeeping display by Cameroonian Charles Itandje. But Geremi, who counts Real Madrid and Chelsea among his former clubs, says that qualifying for Brazil is not going to be enough. "First they have to qualify and then they have to go to the World Cup and do something there," he insisted. "We have a good good team now and that's why we are in the position of being in the last game where a win will get us our ticket to the World Cup. "It means we have been playing well in qualification." Geremi also believes controversial striker Samuel Eto'o is committed to the cause despite recent reports that he wanted to retire from playing for Cameroon. "He is a guy who loves the Cameroon jersey - I think if you ask him he'd say 'I'd love to play for Cameroon all my life'" he said. "Playing at Chelsea will help him for this qualifier and if we do qualify (for the World Cup), playing at that level will help him prepare well."